College Town Phase II mixed-use redevelopment is a retail / condo addition to the already hugely successful College Town Phase I bringing retail, a restaurant and brewery as well as luxury student housing to Madison Street. The College Town parking facility will be located at the corner of South Woodward and Gaines Street providing 580 + parking spaces to the College Town area. The new glass enclosed stair towers under construction at FSU's Doak Campbell Stadium complement the familiar south entry and will provide a scissor stair at each side as well as 6 high speed elevators. Raised on a patterned terracotta base with night lighting, they will further define the entry off of Langford Green. The new Walton Middle School is constructed in the historic core of DeFuniak Springs, FL, replacing all but two structures on the previous school campus. The facility provides 141,370 gsf of new space for a capacity of 818 students. Construction will include: twenty first century classrooms, cafeteria, media center, art & music suites, administration suite and gymnasium all served by a new central utility plant. A commemorative Distinguished Alumni Wall is set to be constructed at Maclay School in the coming months. 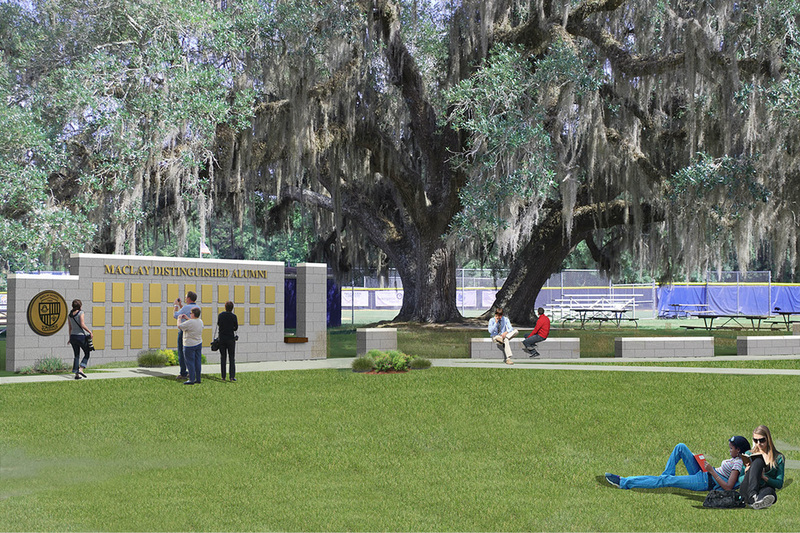 The wall will display plaques in recognition of each year's most distinguished Maclay Alumni, as well as providing a contemplative seating area focused on the sacred Maclay Oak.